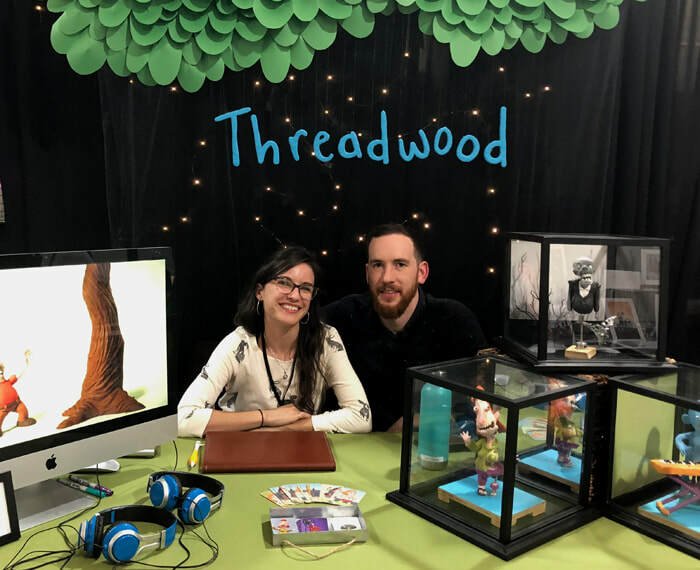 Threadwood is the creative partnership of award-winning animation professionals Alexis Deprey and Scott DaRos. Both have years of professional illustration and animation experience and have worked on projects such as Robot Chicken, SuperMansion, Goldfish commercials, SpongeBob Squarepants, Denny's Grand Slams, Dinosaur Office, MAD TV and more. Alexis was the Art Director for season 8 of Robot Chicken which won an Emmy for the episode X-Mas United, and Scott recently won an Emmy for Outstanding Individual Achievement in Animation for his character animation work in Robot Chicken: DC Comics III, and an Emmy for Outstanding Short Form Animation for his animation direction in Robot Chicken: Freshly Baked. Threadwood brings unique handmade design sensibilities to clay, stop motion, and 2D animation projects. With a combined 10 years of professional experience in the animation industry, Alexis and Scott have developed strong leadership, creative, and organizational skills. Their background in illustration aids their work in animation and cinematography by emphasizing important features like composition, color, and clarity of visual storytelling.